I managed to go the entire month of January without truly finishing anything. I did finish a piece of embroidery, which I’m hoping to post about soon, but I need to attach it to a tea light sconce frame thingamajig, and I’m still figuring that part out. It looks like attaching muslin to it and then stitching the finished piece to the muslin is the way to go, but I haven’t finished testing that theory yet. I’ve spent a lot of time working on the sampler quilt, which is coming along nicely. 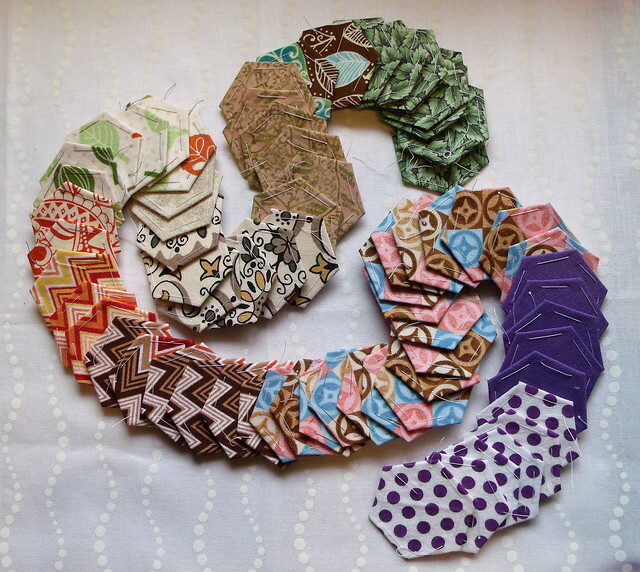 I have all but four of the blocks pieced into four-block chunks now with sashing, and next will be attaching the border in sections and then stitching all the sections together. But again, not finished. A little while back, Kim Werker included a link to the bullet journal web site in her newsletter, and I clicked over to see what that was about. I’m terrible at to-do lists (I lose them) and calender planners (they don’t work the way I need them to, and I end up not using them). I’ve tried using various apps, but I end up ignoring them. If I don’t write it down, it’s like it never existed. This bullet journal thing solves all of those problems for me. I’ve been using it for over a month straight, which is a record for any kind of planner/organizational system, and it’s helping me actually remember to do things, which is pretty awesome. But it needed something. 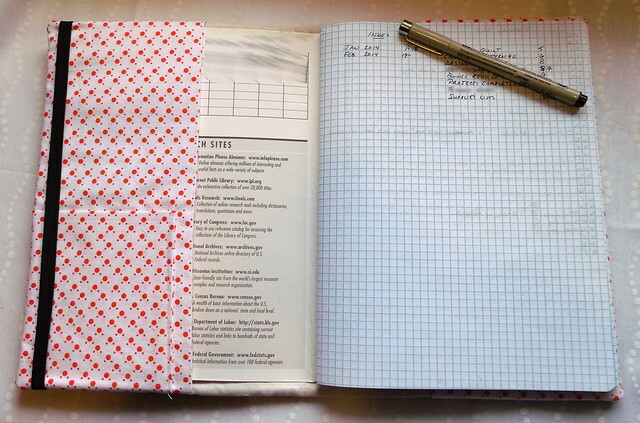 I’m using a graph paper composition book, and I figured it’d get pretty battered over time. And I wanted to make it prettier. 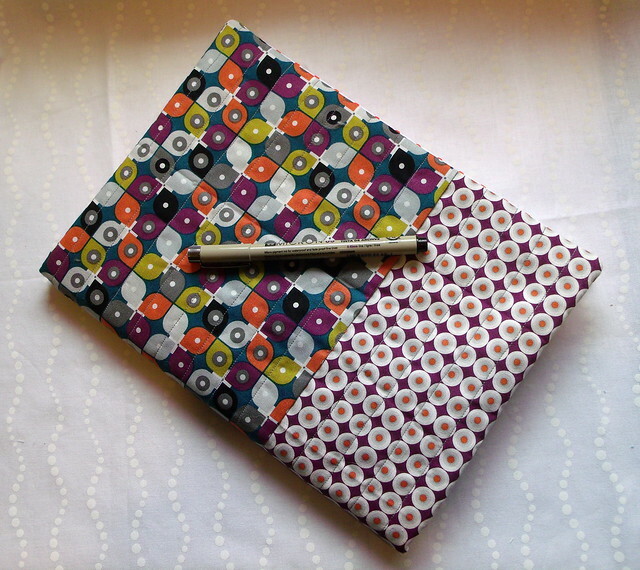 I used this composition book cover tutorial by Amanda of Jedi Craft Girl and some of my stash of MicroMod fat quarters. That Tick Tock print makes me happy just to look at it. I modified it slightly to add a pocket inside the front flap, put in an elastic bookmark, and left off the elastic closure (which sounded handy, but I didn’t have a suitable bit of elastic). I’m trying to decide whether to hand-stitch on a little elastic loop for my pen. I also backed it with muslin. I couldn’t quite bring myself to use something pretty that would only be hidden 99.9% of the time, and I have tons of muslin. I’m so glad to have finished something. I was starting to feel all scattered because I’ve been working on a bunch of things without finishing any of them. 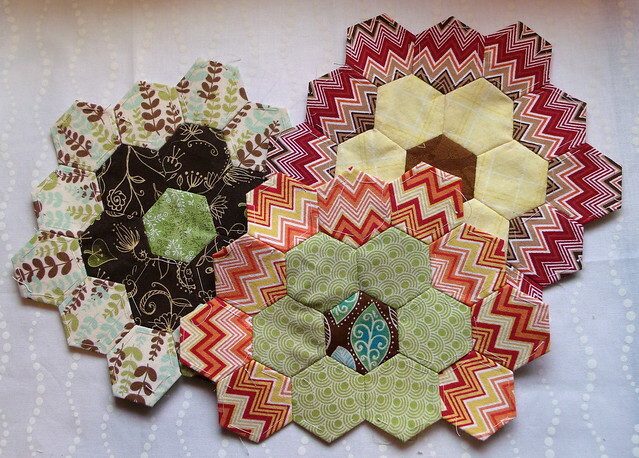 I’ve also been doing some work on the hexagon flower quilt. I basted a ton of hexagons over the course of a few knitting group meetings (I still can’t really knit much, though my hand keeps getting stronger and I’m hopeful that I’ll be able to soon). The bullet journal! So good. I’ve been using mine for over a month too, and for me it’s also a record (and so helpful!). Your hexies look AMAZING. I keep getting all gushy about the bullet journal — I still can’t believe how well it’s working! I love that composition book cover! You did a great job.